Penicuik Athletic Under-13s came from behind to beat Haddington Athletic 4-3 and win the Belmont Vauxhall Cup at New Dundas Park. Penicuik opened the scoring early on. A through ball caught the Haddington defence napping and Ben McManus took advantage to slot home. The setback woke Haddington up and, midway through the first half, they found an equaliser. Jonathon Mainds set up Ollie Craig and his composed finish rolled over the goal-line. Only a minute later, Haddington took the lead, Shea O’Donnell adding his name to the scoresheet after his shot slipped under the unsuspecting keeper. Haddington added another before the half-time whistle. Craig was brought down in the box but was up quickly to take the resulting penalty, which he dispatched into the bottom-left corner. Going into half-time, Haddington looked the more confident team and this was reflected in the 3-1 scoreline. However, Penicuik wasted no time after the restart getting back into the match. A free-kick was whipped into the box and dropped at the feet of Sam Ridgway, who dinked the ball off the post and into the net. Craig came close a further few times for Haddington but was closed down quickly by a revitalised keeper and failed to keep his shot on target. Penicuik were hammering on the door of the Haddington goal and came close through Jackson Marrons but his headed effort from a corner drifted agonisingly wide of the post. Ten minutes before time, McManus took the score to 3-3 with a well-timed header at the back post. With the match tied heading into the final minutes some supporters were bracing themselves for the possibility of extra time. However, Conal McDermott got up well in the air to meet a corner and nod home to seal the victory. A defiant second-half performance by Penicuik saw them deserved winners of the cup, though Haddington were worthy opponents. Penicuik Under-16s won the Division 3 League Cup Final, beating St Bernard’s Midlothian 4-2 after extra time was needed to decide a winner. With both teams having claimed a victory over each other earlier in the season, it would prove to be a tight final. Robbie McNeill was the only player to score in the first half giving Penicuik the lead. After the break, St Bernards came out fighting and scored twice to level the match. The drama wasn’t over, though, as Penicuik’s Calum Curtis equalised from a corner with only seconds left on the clock. Curtis and McNeill both claimed a second in extra time to take the score to 4-2 for Penicuik. St Bernards will have the chance to exact revenge this Sunday as the teams meet again in the league. 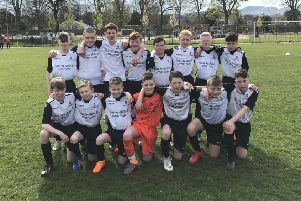 Leith Athletic Under-15s are into the final of the Federation of Hearts Supporters Cup after they defeated Longniddry Villa 2-1. Villa took the lead through Aidan Walsh in the first half but the goal spurred Leith on and Rory Hunter equalised. The only goal after the break came as Ethan Wynn slipped the ball through to Robbie King, who made no mistake and confidently finished off the chance. Leith will face Edinburgh City Blacks in the final.